Few meals are as perfect as brunch, where you’re allowed to drink Bloody Marys and eat doughnuts or cheese-covered egg sandwiches in the same meal. 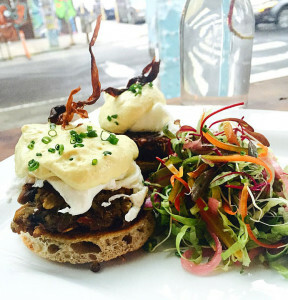 Top picks for Brunch Philadelphia included our own Front Street Cafe. 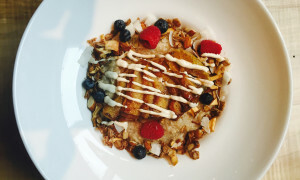 Top Picks for Brunch Philadelphia: Quinoa & Oatmeal Porridge with Vegan Cashew Sweet Cream. While Philly’s brunch game has long been on point new brunch options are popping up at not only new restaurants but tried-and-true spots that only recently started serving the mid-morning meal. For our spring brunch guide, we’ve also emphasized brunch that can be enjoyed via sidewalk seating, backyard patios and at completely-outdoor restaurants — think Front Street Cafe in Fishtown. All of the brunch options mentioned below offer the meal on both Saturday and Sunday, and Front Street Cafe serves brunch 7 days a week until 4pm. Below you’ll find some of our favorites for daytime dining for days when breakfast starts whenever you roll out of bed. Where are your favorite springtime brunch spots? All of the brunch options mentioned below offer the meal on both Saturday and Sunday, and a number of the restaurants even serve brunch on weekdays, too.